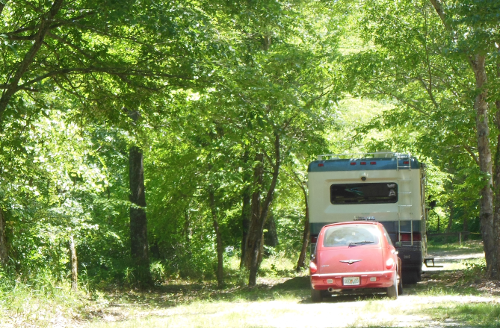 On June 8th, despite some very strong winds buffeting the bus (which is amazingly stable to drive in windy conditions despite being a huge slab-sided vehicle) we arrived in Asheville NC in the early afternoon with a plan to go tubing down the French Broad River immediately. Alas, the winds were so strong they were actually blowing the people trying to tube UP-river, instead of letting them drift downstream. The staff of Zen Tubing were busy retrieving their customers who’d been stranded by the winds from spots all over their route. The high winds turned a two-to-three hour “normal” fun, tubing adventure into a five-or-six hour ordeal. So we didn’t go tubing the day we arrived, despite our plan. We found a nice place nearby to boondock camp for the night, turned on the generator and worked! By the next morning, the wind had died down to a gentle breeze: just enough to cool things off. We worked through the morning (we do that a lot to support our nomadic lifestyle) then put on swimsuits and a ton of sunscreen, then off to get our gear and float down the river. Yay! After we checked in, signed waivers, and paid a $10/person fee, one of their many staff teenagers drove us in a van to a spot about two miles upriver, gave us our tubes and paddles and helped us get onto the tube and into the water without getting soaked in the process. He was friendly and helpful; quite professional, really. I had tubed on this river before, with some friends back in the 90’s, so knew what to expect. But this was a different company, and the experience and route were different — we didn’t go floating past the Biltmore Estate this time. This was a much more “natural” route, mostly just trees on the riverbank, with only a few indicators of civilization visible (such as the occasional back yard of a house with boat dock, and when we drifted under the busy freeway). My previous tubing experience had floated us through what I suspect now was the heart of Asheville. 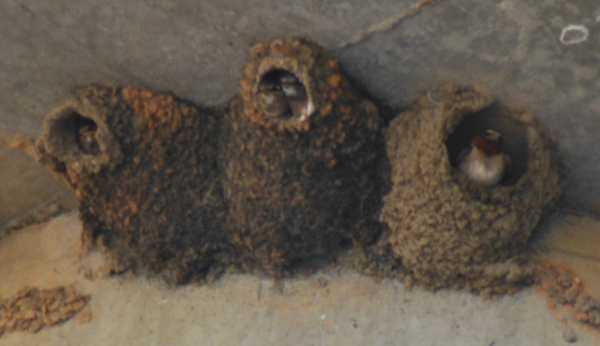 There were hundreds of bird nests on the underside of the freeway (Marie said they were “cave swallows” but we haven’t verified it) and many of them contained cute baby birds poking their heads out, yelling for more food. After two hours (which felt like four) we spotted the flags indicating the end of the trip, and a big sign saying, “Stand up!” Which we did – the water was only a couple of feet deep. We climbed out (they have steps making it easy) and turned in our tubes and paddles, and the tubing experience ended. No need for reservations. Just show up some time between 10 AM and 3 PM. They offer you a paddle when you select your tube. Say Yes! You’ll need it to push yourself over some of the submerged rocks and avoid snags, and to paddle your way out of some big eddies. 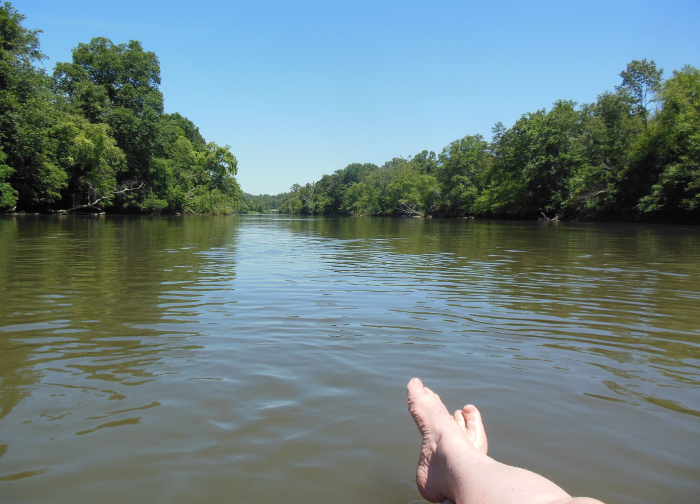 This stretch of the French Broad river is sluggish, shallow and yes, broad. Bring water to drink, more sunscreen, and a camera or phone. Stay hydrated! Wear old sneakers or something that you can wear to actually walk on rocks under water. Flip-flops won’t cut it. Put everything you bring with you in Ziplock bags so if they slip out of your control, they’ll float as opposed to sinking so you can easily retrieve them. Watch out for the dragonflies landing on you. 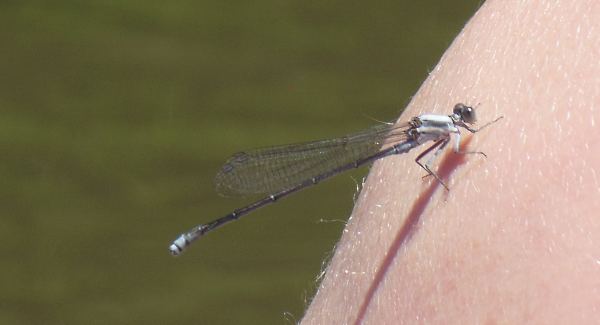 There were many, many dragonflies on the river. They have no stinger so can’t sting you, but if you let them sit on your skin for very long, we can attest that they will bite you with their mandibles – it feels like a pinch and doesn’t leave a mark, it’s just slightly painful and unpleasant. They are easy enough to shoo away.